There – I’ve quoted the name. The one that’s tripping off practically every Hibs supporters lips at the current time. Presently Derek remains sitting out his contract at Celtic, shorn of match fitness by manage r Strachan who appears to have taken personal exception to the young goal scorer and who has consistently refused to play him for the Glasgow club during his own at Parkhead. At the time of writing – and this situation is a dynamic one that could change at any moment, the transfer window in Scottish Football is due to close on Monday and the usual rumour-mill is wound up to full speed. The Hibs online communities are beside themselves to discuss the possibly of a Messiah-like return to Hibs of the slimly built hit-man. Literally scores of forum threads have been dedicated to the subject rendering the persuing of those messageboads almost unreadable at times. As those with an interest know, Derek left Easter Road around two years ago amidst a bad atmosphere and one of recriminations around the manner of his departure. He was seen by many to have sold the club short financially at that time and one of the many rumours surrounding his exit was that CEO Rod Petrie had played hardball with the youngster and in turn the player had responded accordingly. Of course this is just one of the theories and perhaps we will never know the truth. The cry at that time was one of ‘Judas’ from a vociferous section of the Easter Road faithful. We’ve become used to seeing seeing the word ‘loyalty’ become a redundant one in modern football – from players, managers and supporters but the scale of abuse was as great as I had personally ever witnessed from my fellow Hibs fans. Disturbing in its intensity in one or two individuals. that promise. 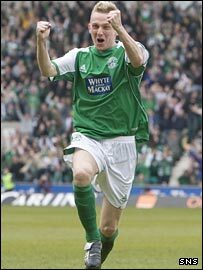 In his Easter Road days he was sometimes reviled for his lack of work-rate and indifference to tackling and tracking back when Hibs weren’t in possession of the ball. Whilst always applauding industry and a good work ethic in a professional, asking Derek to undertake that type of role was missing the point of his game slightly I always felt. There were occasions he didn’t necessarily help himself in that respect but at the same time his opportunities were often denied due to being consistently substituted by manager Mowbray at that time. It’s certainly a facet of his game that the player will have to pay attention to in order to resume his career progress however. So the controversy regarding a return to Edinburgh continues to rage. Of late there have been thousands of words expounded by the Hibernian support and press alike regarding the situation and in spite of being a fan of the player I can’t help but feel that in the event of his potential second coming he will have far too much too live up to in people’s slightly unreasonable expectations. I hope that I am proved incorrect in the event. Knowing Derek Riordan it would be just like him to drive a swerving 25-yarder into the top of the net on his debut.ernian What happens if he isn’t able to keep that type of magic up or game after game though. That is my worry as us Hibs fans have become increasingly short of patience and fractious with our players these days. In the meantime I’ll be avoiding those ‘stories’ surrounding his return, his social life, his Range Rover and what he eats for breakfast.